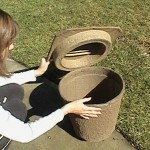 PRODUCT DESCRIPTION: Heavy corrugated cellulose material that has been molded into a "flower pot" look that comes with a "lid". They stand about 13 inches tall and 14 inches wide at top. 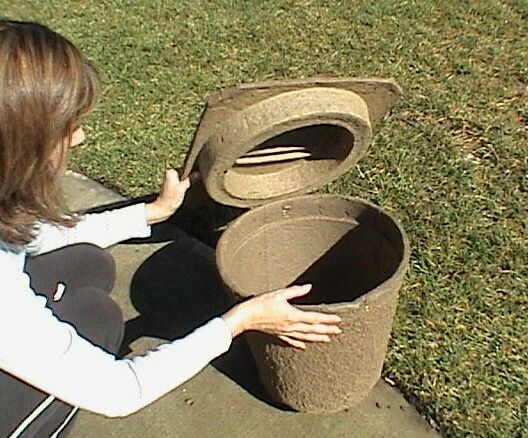 The lid will fit snugly and keep any bees contained. Like most flower pots, there is a small hole on the bottom, about the size of a nickel, through which the bees can enter and exit. Bees like to swarm and nest around cellulose so the construction material being used is conducive to getting bees. Once a swarm or nest has been discovered, the bees can be managed many ways. The hole can be sealed allowing the hive to be relocated as needed. When used for monitoring Killer Bees, bad nests or undesirables can be exterminated easily as well using the same hole as the injection path. Ideally these should be set out in trees, bushes, under the eaves of a building or where bees naturally would like to swarm and nest. Adding some Swarm Lure inside will get bees to it all the more faster. WHERE TO USE IT: Anywhere bees are active and likely to swarm. This will usually be in the open eaves of structures, attics, crawl spaces, barns, sheds, trees, bushes, fence rows and other locations where bees have been a problem or have nested in the past. RATE OF APPLICATION: Use one per acre and inspect at least once a month; more frequently during swarm season.